I had posted a series of grab shots to Facebook as I put this structure together over the past weekend. Now that it’s pretty much finished, I thought it might be helpful to compile those into a blog post. Here’s a survey of a rainy Sunday afternoon project. 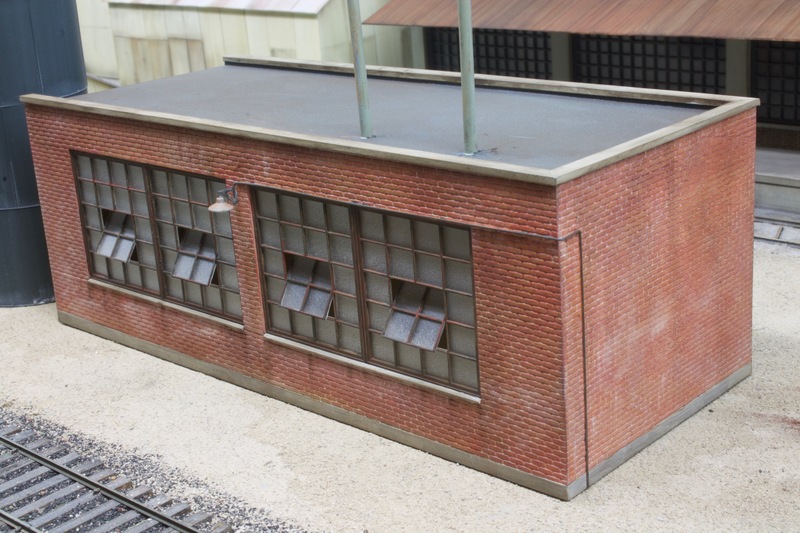 The low building next to the recovery boiler would be based around Grandt Line industrial windows that I had in stock. I glued up the front wall with two paired windows and copied the overall dimensions for the back wall. Only one side wall is needed because this building is connected to the recovery boiler on the other end. With the sides and floor cut from .040″ styrene, I set about squaring everything up and gluing it solid. N Scale Architect makes some really nice styrene brick sheet that I used for the first time on this project. Here’s the whole structure, clad in brick. In hindsight, it was ill-advised to glue the concrete foundation onto the base of the walls before the brick was finished. I should have worked from the top down with the brick veneer and then filled in whatever was left over with plain styrene strip when I got to the bottom of the wall. The other two walls were easier because they have no windows. I shot the whole building with Stynylrez surface primer from Badger. Got this tip from Brian Banna. He’s forgotten more about building models than I’ll ever know, so I tend to trust his lead on stuff. The brick colour went on first. It was a mixed by eye from a photo of the recovery boiler building. For those of you who’ve never tried mixing colours, it’s way easier than you probably imagine. Start with Mixing White. In this case I added Crimson to get a pink, then Burnt Sienna to make it brown. If you screw it up, wash off your palette and start over. The darker the colour you’re adding to white, the less of it you need. The mortar colour went on next. I mix my mortar colour starting with mixing white and adding Raw Umber to get a warm grey or grey-beige colour. That’s the paint in the palette on the bottom right. Smoosh it in, then use a flat wet brush to wipe it off the face of the bricks. Window frames were painted with Model Master Raw Umber and some Vallejo Olive Drab patched on. A wash of Burnt Sienna brings out some rusty details. The concrete was done with a light grey painted over the primer colour. It will get a more complex concrete colour when it gets weathered. The glazing is made from an acetate sheet sprayed with dullcote, cut to size, and glued in with canopy cement. I added a light to the middle pillar of the long wall, and a conduit bent from phosphor bronze wire. A couple of stacks were made from styrene rod. The roof was shot with a base of Vallejo German Grey, and then Olive drab and USAF Medium grey spattered on coarsely. I touched up the walls with some Pan Pastels to give the effect of rust and dirt stains and some efflorescence. Here’s the finished building set temporarily onto the spot where it will eventually go. The recovery boiler will be a tall building to the left of this one. There’s a bit of a story behind this project. Over the past weekend, I decided it was time to move forward with filling the vacant space in front of the materials storage building. This scene is a product of my imagination, because the detailed photos I have in my collection don’t capture this part of the mill. I had built a mock-up of how I wanted it to come together, taking cues from photos of other areas in the mill. I was having second thoughts about my plan for this space, maybe because I’d already spent too much time thinking about it. One day last week, my neighbour and model train guy Paul Bellemore walked across the street for a visit, and we got talking about this space and how my plans for it had changed. After I described what I was considering, I asked for his opinion and he said he liked my original mockup better. He gave me a couple of reasons that made a lot of sense, so I figured it was time to stop analyzing and start building. For me, the hobby is as much about friends as it is about the models. It’s probably extremely rare to have an excellent modeller living right across the road. How cool is that? nice work and nice writeup. very clearly worded and thought out. makes me want to go to the basement now…..except I’m at work and the grandkids visiting will keep me from working there for a while…sigh…. Yes, having a fellow decent(my words) modeler close by would be a boon to me for inspiration and motivation. Thanks Loren. It’s nice to know that someone out there is getting something out of my blog. It makes it worth the effort. Loren said it perfectly. i’m motivated to start on a scratch-built structure I’ve been planning for a long time….several in fact. Thanks Hunter. Cheers! I hope my post helped. I find most of the blogs you post to be great ideas I would like to use on my layout, your building is a perfect example. New ideas to try, expand my skills, thank you very much Hunter! Very kind of you to say, Scott. I’m pleased that someone is finding my blog useful! Very nice build and coloring Hunter! What adhesive did you use to attach the brick texture to the sub-walls – the Tamiya Extra Thin cement shown in the background? BTW – nice talking with you and your friends over drinks at the NE proto meet earlier this summer. Hi Mike. It’s good to hear from you. I use a thicker Tamiya cement on both pieces and then use some weight or clamps to ensure good contact. If there are any edges didn’t cement tightly, I use the extra thin cement to touch them up.